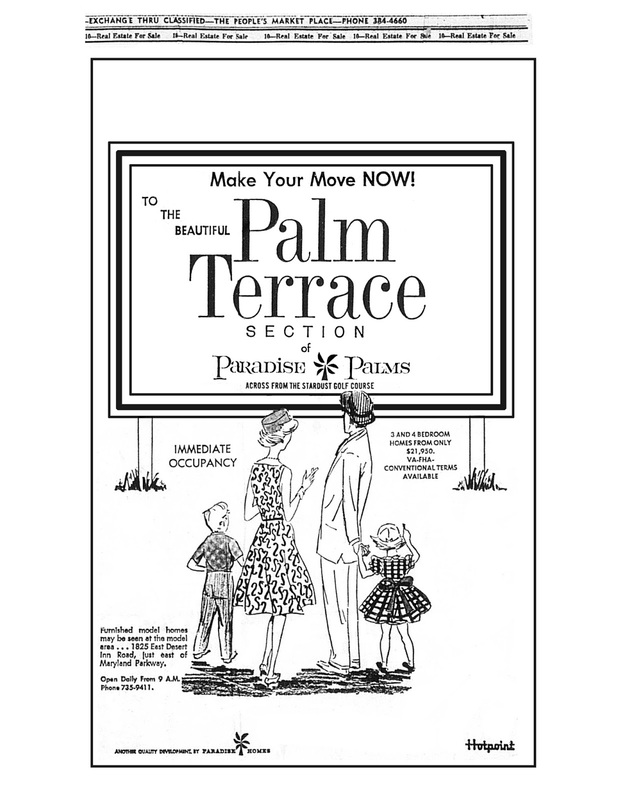 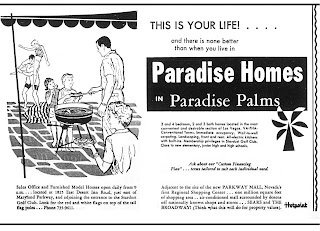 In 1964 a majority of the construction activity at Paradise Palms begun to wind down, and in an attempt to capture new buyers Paradise Homes modified their advertisements to some new formats. 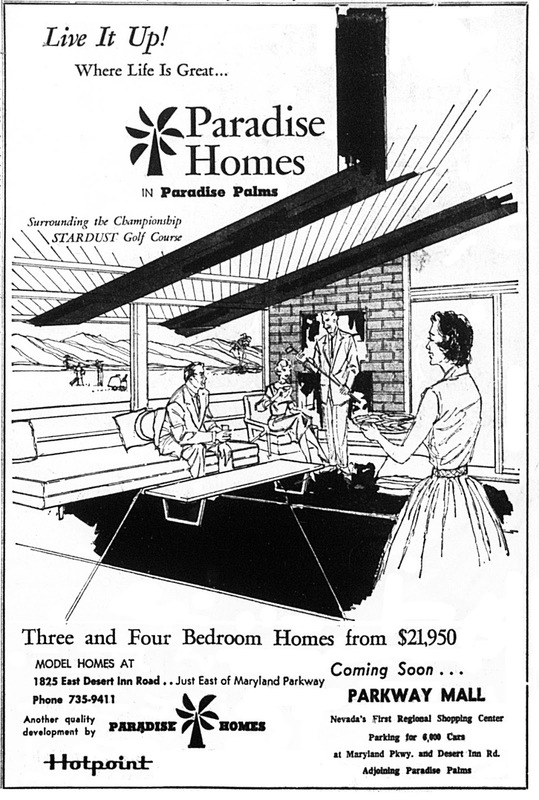 These included the use of a generic ‘billboard family’, nonspecific sketches depicting fictitious living environments, and simple black & white text. 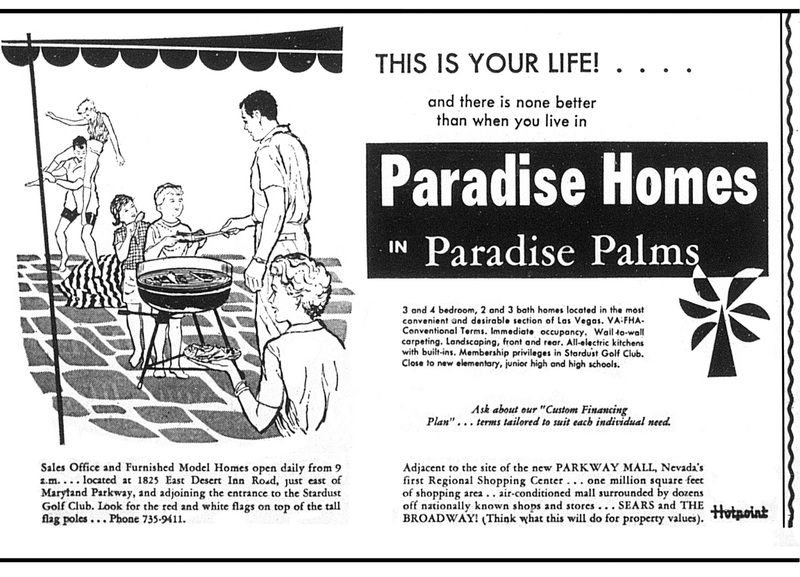 Also, the Paradise Palms and Paradise Homes fonts seems to have changed a bit, with the Paradise Palms lettering no longer using the signature lower case a’s and i’s, while the Paradise Homes font now begun using both uppercase and lowercase letting for it’s name in various ads. 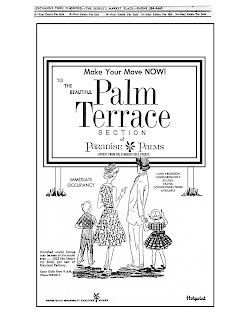 The family admiring the billboard is seen once again, this time staring at a billboard advertising the Palm Terrace section of Paradise Palms. 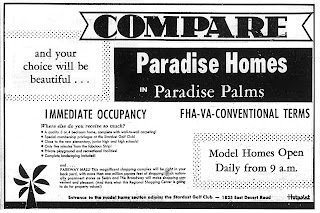 Other builders had made their way into the Paradise Palms community and each sought to differentiate themselves from one another, and the original Paradise Homes was no exception. 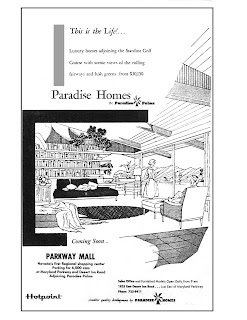 Also featured in this series is a rare look inside one of the original Palmer & Krisel model homes with interior design by C. Tony Pereira. 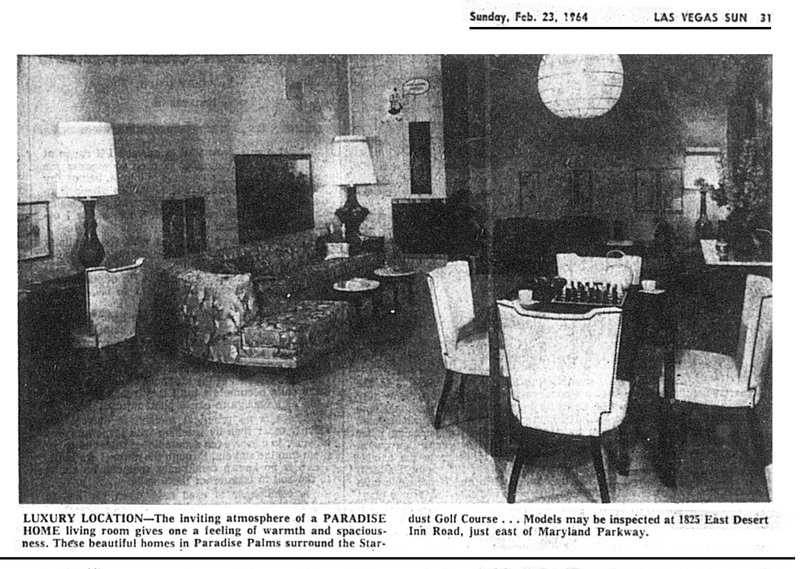 The home seen in the photograph is a Model 1, with the photo taken from the kitchen looking into the dining and living rooms. Windows and sliding glass doors to the backyard or patio space are to the right of the photo; early models featured the fireplace in the interior corner of the living room (as shown), while later models placed the fireplace along the window wall shared with the dining room and kitchen (as shown on the floor plan within the sales brochure). 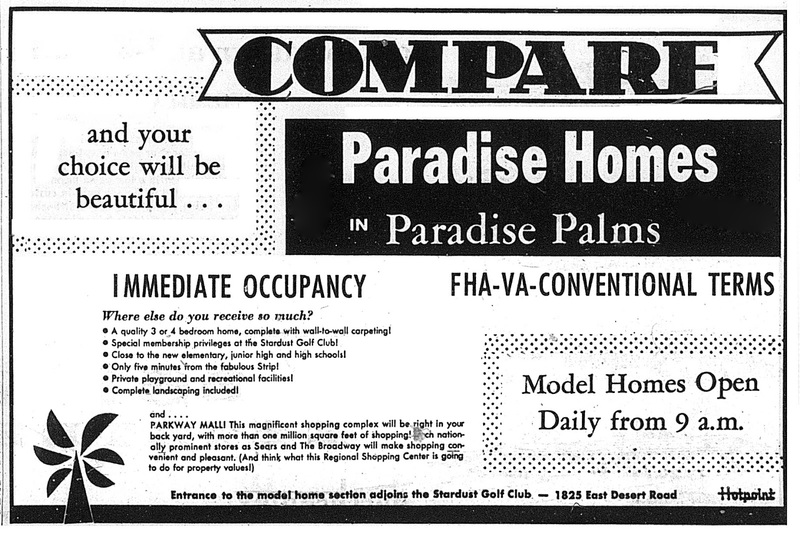 Featured in the May 10, 1964 Real Estate section of the Las Vegas Sun is the Model 14h, noted as the Hawaiian elevation. 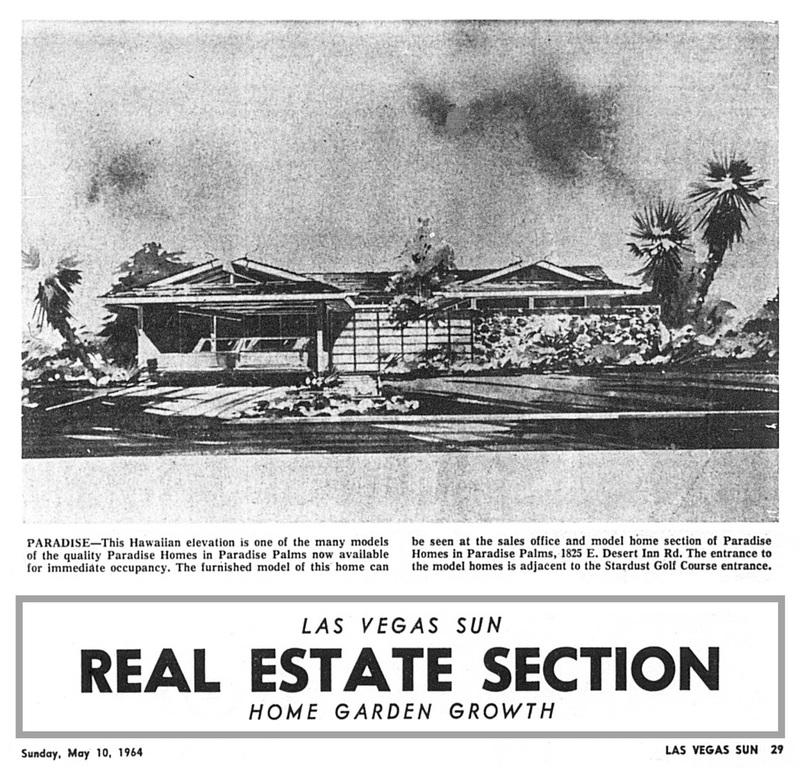 The original Plan-O-Ramic Model 14h is located on Seneca Drive, just south of Desert Inn Road.